Good afternoon, BB addicts!! Just a quickie afternoon post to bring everyone up speed. I have some exciting news for y'all: Big Brother has been officially renewed for another season!! :D Yayy!! Season 16 of Big Brother will air next summer. The news just broke a few minutes ago & twitter has exploded with the info! At 12:58pm BBT, Andy suggested that they all (Spencer/Andy/GM/McCrae) sit down at the dining room table and talk. They outed their Final 4 "The Exterminators" alliance to McCrae, basically telling him that he's going to jury tonight (though they are not allowed to flat-out out say how the votes are going to go, per productions rules). 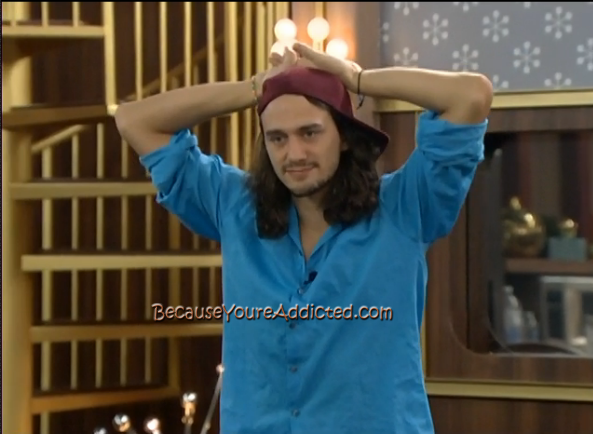 McCrae's reaction was calm, mixed with frustration and him saying "F**k! I knew it!" over & over again. If you'd like to Flashback to the moment, pick Cam 1 at 12:58pm BBT. As of 1:50pm BBT, all 4 of them are still talking, going over moves the alliance made, McCrae now regrets voting out Elissa, Andy told him he voted Amanda out, not Elissa, etc. McCrae keeps saying "F**k!" repeatedly. But, YEA for BB next year - let's hope they bring in all new people at the top to shake it up!!! Just thinking - you have to imagine that whoever picks will take perv Spencer to the finals, as the person to beat. Unless he picks - LOL - I guess anything is possible. The fact that week happened to be a DE is what I thought would and did cause McCrae to put up Elissa. Even though he was almost positive it was Andy with so little time to think and how prepared everyone else was for that exact situation compared to how frazzled and confused Elissa was it's understandable how McCrae made that choice. If it were a regular week where McCrae had a day to think everything through and Elissa had that same time as well to settle down and have an actual conversation with him things most likely would've been different. That situation was mostly just luck and timing combined with the prior prep work they did to formulate a game plan. Welcome to reality, McCrae. And... at least have fun in the jury house for a few days. Pretty sure they'll let you share a bedroom with Amanda. McCrae could tell whoever is voting for eviction, which would be either Spencer or GM, that he (McCrae) would make sure Andy won the game because of his influence in the jury house so the best they (Spencer or GM) could hope for is 2nd place. It's a hail Mary but maybe one of them would bite in hopes of teaming with McCrae and taking their chances with McCrae. OMG @Jamie & @Rigs........brilliant!!!! Can and will McCrae's brain move as fast as yours both have??????? There's always one last chance for a Pandora's box!! POV was played yesterday and Andy won. Andy's initial noms were Spencer and McCrae but POV ceremony will be live tonight so Andy can use it and change his noms if he wants. McC should tell Andy that if he goes to jury that he won't have his and Amanda's vote and he is going to make sure no one else will vote for Andy either ... it's worth a try ... right? I don't think GM or Spencer are planning on taking Andy to the F2 anyway. I think they'd take each other. And McCrae would be much more difficult to beat in both the 3 part Final HOH and in the F2 than Andy. So no way could I see that working unfortunately. I think McC suspected Andy's treachery but he had so much antipathy for Elizzard that he just wanted her out, under any circumstances. He knew he couldn't count on her anyway. Never thought I would say this, but I'm officially Team Andy. I feel he's been the least disgusting (which isn't saying much for this group)! He was a snake and a weasel, but who hasn't been in the history of this game? I can't condone bigots, sexists and pedophiles being awarded for bad behavior--no matter how entertaining and crafty they may be. At least Andy wasn't offensive--just annoying as heck. Tamara D, I agree, the lesser of two evils........I hope when Aaryn, Amanda,GM and Spencer find out about their jobs it is on camera. It has been a disgusting group of ppl. wants to work with Elissa. This year their isnt any 1 clear cut winner. You can only root 4 the 1 player you dont think is quite as bad as the rest. Sadly I don't think that would work either as if Andy is in a F2 with McCrae he obviously wouldn't have Amanda's and McCrae's votes then either. Plus there'd be quite a few other votes he wouldn't have compared to being against Spencer or GM. I hope Andy wins. Honestly of the 3 he's played the best game. All winners in the past have really been a snake or rat art some point. At least he made smart moves and had actually won 4 competitions. I also agree with what's said above. Between all of gm comments and Candice eviction or Spencer's offensive comments about Jessie our the pedophilia stuff. Andy is by far the most deserving winner that remains.